NINE-year-old Thomas McEvoy has collected his first winner’s trophy on the Cuestars Under-21 Tours. McEvoy made a group-stage exit in the Bronze event but beat six-year-old William Thomson (Chandler’s Ford) in the final of the Plate competition for non-qualifiers. The trophy presentation had to be hurried as it was 6.50pm, ten minutes before Thomson’s bedtime. 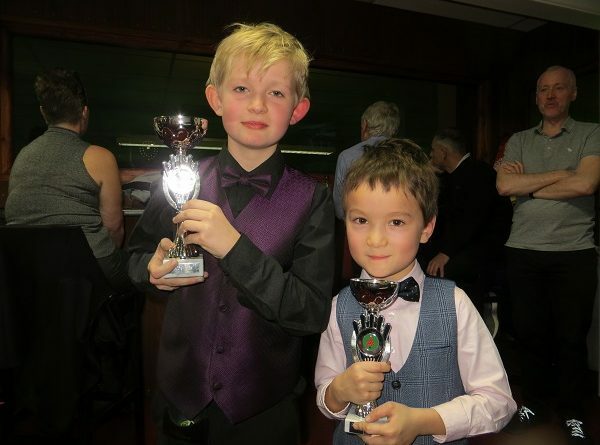 The sixth of the ten legs are at Greenbaize Snooker Club, Bournemouth, on Sunday, February 3. PRELIMS: Riccardo Drayton (Chandlers Ford SC) beat Zak Truscott (Waterlooville Sports Bar), Daniel Walter (Mayfair, Gosport) beat Eddie Mason (Salisbury SC), William Thomson (Chandlers Ford SC) beat Harry Wilson (Waterlooville Sports Bar), Jamie Wilson (Waterlooville Sports Bar) beat Katie Griffin (Jesters, Swindon), Keegan Reed (Salisbury SC) beat Chloe White (Waterlooville Sports Bar), Thomas McEvoy (Salisbury SC) beat Sam Walter (Mayfair, Gosport). QUARTER-FINALS: D Walter beat Drayton, Thomson beat J Wilson, Reed beat Taylor Elliott (147 SC, Swindon), McEvoy beat Freddie Turner (Salisbury SC). SEMI-FINALS: Thomson beat D Walter, McEvoy beat Reed. Picture by Tim Dunkley: Thomas McEvoy (left) and William Thomson.